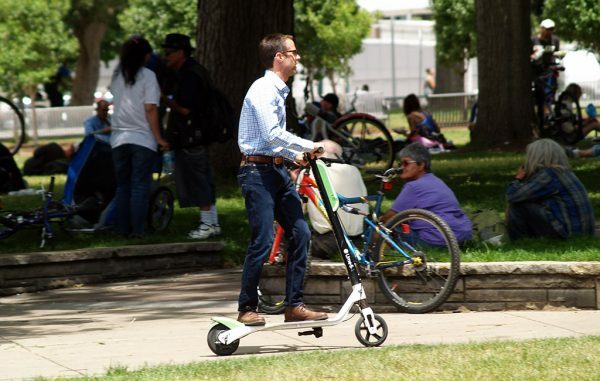 As the City of Denver deals with a swarm of dockless electric scooters that swept into town around Memorial Day, a small army of locals is responsible for keeping things rolling. The two companies responsible for the city’s sudden burst of scooter traffic, Lime and Bird, rely on a fleet of 1099 contract workers to recharge the electric two-wheelers. One of them is Stephen Joos, a product manager for mobile service startup Visible, who said he and his girlfriend first encountered Bird scooters on a trip to Nashville, Tennessee. He signed up to be a “charger” before coming home. Bird called Joos before it launched in Denver and sent him a brief training video before he was approved as a charger. “I’d never done a side hustle or anything like that, but it just seemed like fun,” he said. He made about $30 for charging five bikes during the first week of June, which took about one hour of work in total. Craig Baute, founder of Denver coworking office Creative Density, started working for Lime as a “juicer” in late May when the company launched here. He first encountered Lime scooters in Santa Monica, California, in March, and followed the company closely as it added the Denver market. He spoke with a Lime representative, watched a video, completed a quiz and sent a photo of his driver’s license to Lime before he started. “It takes about 10 minutes,” Baute said. He made about $250 in his first week with Lime. He’d pick up a couple scooters during his lunch break and take more home after work, using a laptop-sized charger to power up scooters both at the office and inside his house. Denver Public Works officials became alarmed by the large number of scooters that riders left in roadways, alleys and on sidewalks, which government workers had to remove. 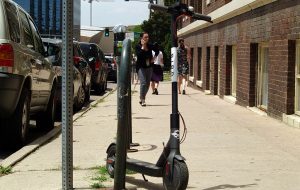 So the city told Lime and Bird to remove scooters from these public areas or risk fines and citations. But as long as the transit startups have citizens doing the legwork — picking up, charging and storing scooters in their homes — the city might find it difficult to enforce the rules. Denver isn’t the only city to encounter these problems. San Francisco officials went further, telling Lime, Bird and a third company, Spin, to cease operations by June 5 – adding that they could apply for permits. Lime juicers and Bird chargers scoop up the scooters left scattered across town, are paid per scooter they charge, and return them to a designated block or area. The payout is based on several factors, including how far workers travel to pick up a scooter or how long it had been waiting to be picked up. The amount typically ranges between $5 and $20 per scooter. It takes about 5 hours to fully charge a depleted scooter, which can run for about 20 miles at a top speed of 15 miles per hour. Customers pay $1 through an app to unlock a scooter plus 15 cents per minute of riding. Scooters usually need to be charged at least once a day, making the companies’ pickup workers a critical part of keeping things running. Lime recently reported that more than 7,000 riders used its scooters to travel in Denver in its first six days of operation, with a total of 16,000 trips and 22,000 miles. Based in San Mateo, California, Lime was founded in January 2017 and operates in at least 60 markets. From Venice, California, Bird launched in September 2017 and may expand to Europe.